Srinagar, February 6: The Army has detained three soldiers for questioning in a case related to the killing of Rifleman Aurangzeb of the 44 Rashtriya Rifles, who was kidnapped and later shot by militants in Pulwama district of south Kashmir on June 14 last year. An inquiry by the Army is underway to ascertain the role of the three soldiers. An Army officer on the condition of anonymity said “the three soldiers are with them and an inquiry to ascertain their role is currently underway”. Asked whether the soldiers had been formally arrested, the officer said: “Further action will follow only after the outcome of the inquiry, which may take one to two months.” It is suspected that the detained soldiers might have leaked information about the movement of Rifleman Aurangzeb to the militants. The slain soldier was travelling in a private vehicle to Poonch to celebrate Eid with his family when he was abducted by militants. Rifleman Aurangzeb was close to Major Rohit Shukla, who had gunned down Hizbul Mujahideen commander Sameer Tiger in Kashmir in April 2018. The three soldiers, all from the Valley and belonging to the 44 Rashtriya Rifles, have been identified as Abid Hussain Wani from Pulwama, Tajamul Ahmed from Qazigund in Kulgam, and Adil Wani of Tahab in Pulwama. One of the soldiers being questioned is the brother of Tauseef Ahmad Wani, who was allegedly tortured by Major Rohit Shukla at the Shadimarg camp, where Rifleman Aurangzeb was posted, Tauseef’s family disclosed. Tauseef is currently undergoing treatment at Shri Maharaja Hari Singh Hospital in Srinagar. 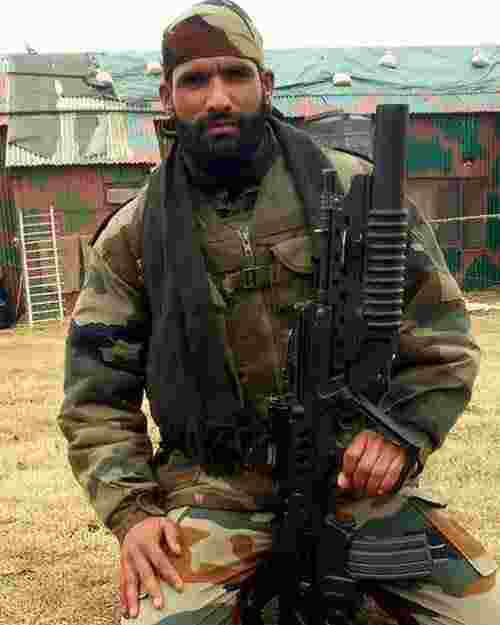 The body of Rifleman Aurangzeb, shot in the head and neck by militants, was found by a team of the police and Army at Gussu village, about 10 km from Kalampora in Pulwama, from where he was abducted. “Since June 2018, we have not heard anything about him (Abid). The Army is also not telling us where he is,” said a relative of Abid. ■ An Army officer on the condition of anonymity said “the three soldiers are with them and an inquiry to ascertain their role is currently underway”. ■ It is suspected that the detained soldiers might have leaked information about the movement of Rifleman Aurangzeb to the militants. The slain soldier was abducted by militants in Pulwama on June 14 last year and later shot dead.